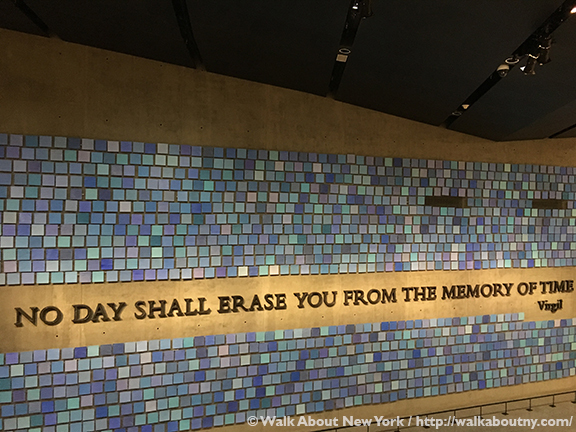 The Wall of Remembrance at the 9|11 Museum. September 11th 2001, known as 9|11 to many Americans, was the date of a horrible tragedy. America had been attacked by al-Qaeda terrorists. The most horrific catastrophe took place in New York City when the World Trade Center’s Twin Towers were each struck by separate jet airplanes. Their collapse and the loss of nearly 3,000 lives at the World Trade Center left a wound on the Big Apple. Creating the 9|11 Memorial and Museum on the site of the Twin Towers has helped heal that wound. Both the Memorial and the Museum are emotional places of pilgrimage, even if one lived in New York during those horrific hours and days. Here are some of the larger artifacts that are on display at the 9|11 Museum. 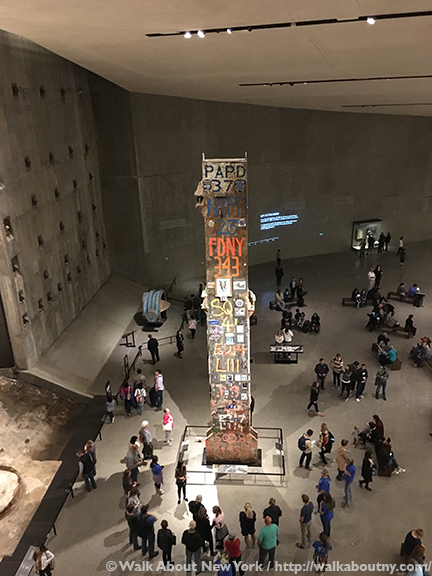 The Last Column at the 9|11 Museum. The symbolic “Last Column,” weighing around 60 tons and 36 feet long, was the final piece of World Trade Center Tower Two to be removed from Ground Zero. The recovery workers used this column to mark their own connection with their time working at the site, and to remember those who lost their lives there. The column is so tall that the 9|11 Museum was built around it. Although it was the last to leave Ground Zero, it was the first to return. Part of an antenna at the 9|11 Museum. 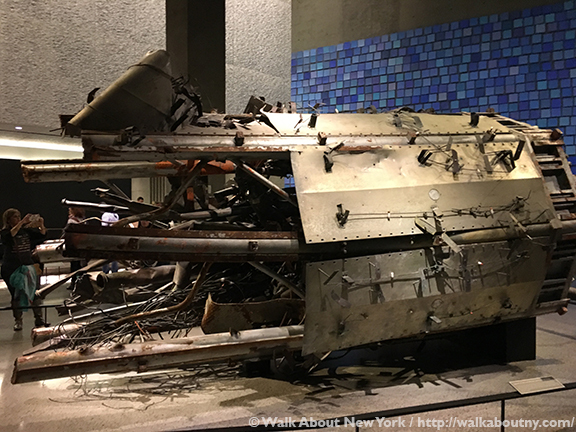 This is a section of the radio and television antenna that was atop the North Tower of the World Trade Center; it had been assembled there. Beginning in 1980 it began transmitting television signals. A high-definition TV master antenna was installed in 2000. For most TV stations transmission failed when Flight 11 flew into the North Tower. At the time of the Tower’s fall, 10:28 AM, all signals ceased. 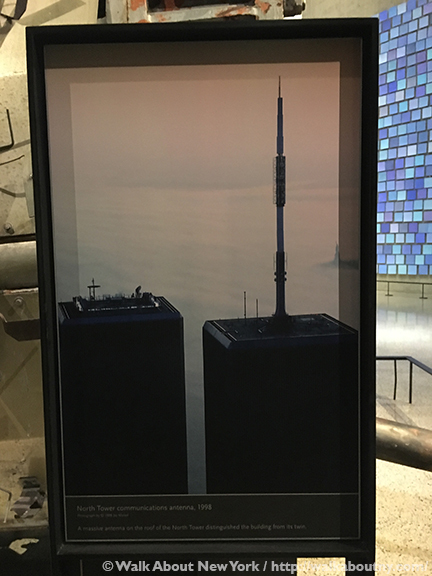 Photo of the North Tower’s antenna at the 9|11 Museum. A photo near the antenna part shows the full transmission tower as it looked on the North Tower; it stood 360 feet tall. 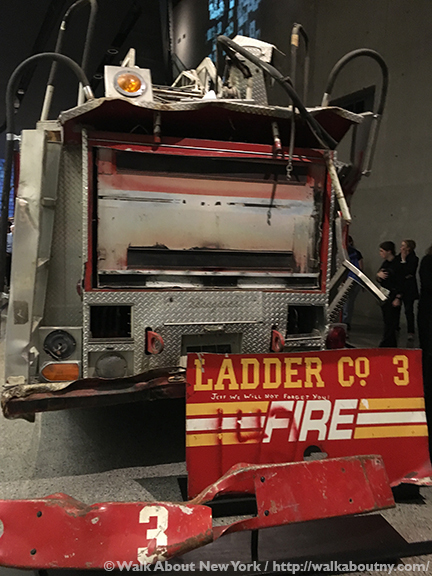 A portion of the FDNY’s Ladder 3 at the 9|11 Museum. The Fire Department of New York Ladder Company 3, located in Manhattan’s East Village, requested a dispatcher to send it to the World Trade Center on 9|11. Because the airliners struck when a shift was changing, some of the firefighters, who had just gone off-duty, remained, riding to the disaster. When the members of Ladder Company 3 reached the disaster they entered the North Tower. The men of Ladder 3 headed up into the North Tower to find and evacuate victims who had been burned and injured. 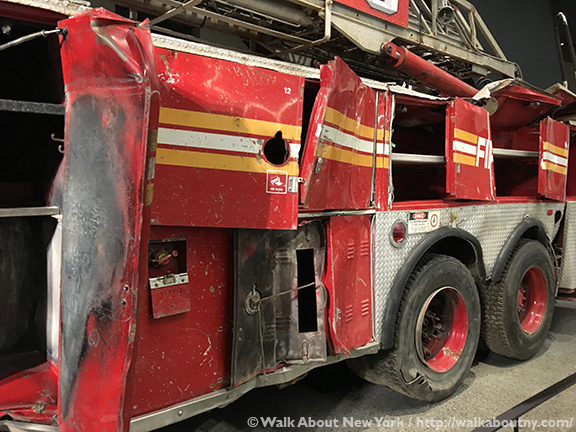 Carrying 100 pounds of protective gear and clothing, the firefighters began to climb the stairs to the 95th floor where Flight 11 had struck. Going up they passed many office workers coming down. Later these exiting evacuees said that when they passed the ascending members of Ladder 3 they felt reassured that help had arrived. Eleven of the Ladder Company 3 firefighters on duty on 9|11 were killed when the North Tower collapsed. They were Patrick John Brown, captain of Ladder 3; Michael T. Carroll; James Raymond Coyle; Gerard P. Dewan; Kevin W. Donnelly, lieutenant at Ladder 3; Jeffrey John Giordano; Joseph E. Maloney; John Kevin McAvoy ; Timothy Patrick McSweeney; Joseph J. Ogren; Steven John Olson. 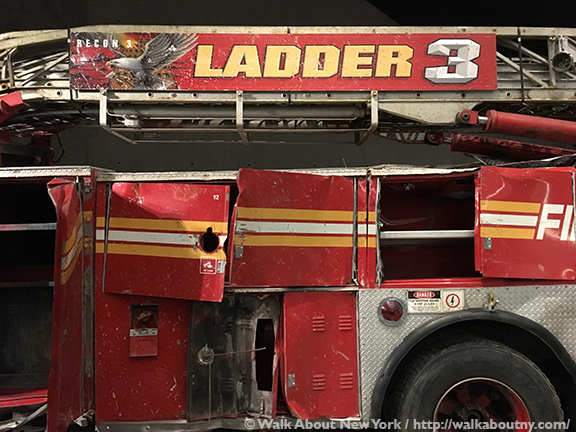 When the Towers collapsed, Ladder 3’s fire truck sustained so much damage that it could not be repaired. 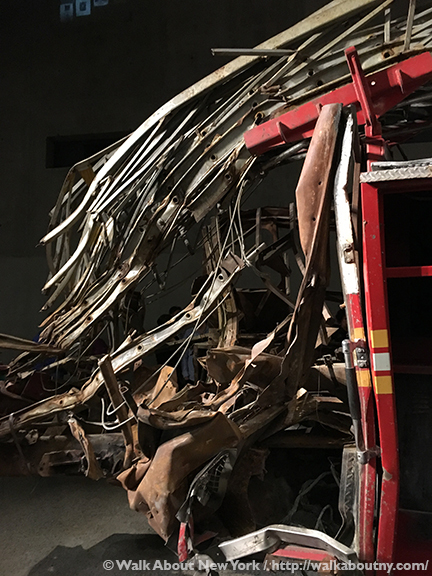 As the recovery efforts began, it was removed from West and Vesey Streets, where it had been parked, and stored at Hanger 17 at JFK International Airport, where other pieces of the Towers and relate materials were kept. 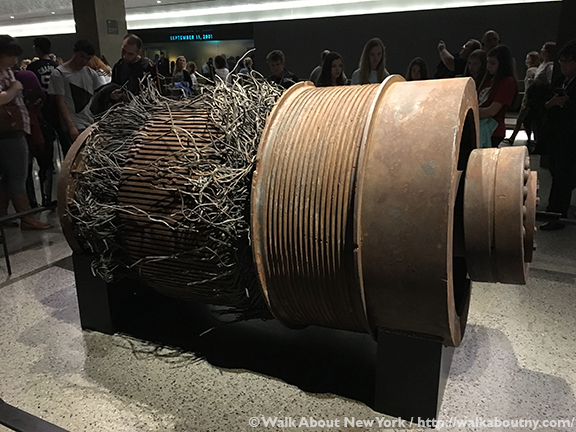 An elevator motor from the Twin Towers at the 9|11 Museum. Pictured above is an elevator motor. It was the largest of its kind when it was installed. Powering one of the express elevators, it was one of a total of 99 in each of the Twin Towers. The motor could move an elevator car at a rate of 1,600 feet per minute. Our Downtown Manhattan Walking Tour takes you inside a crucial sight connected with 9|11, St. Paul’s Chapel. It was a place of rest, comfort and shelter for the recovery workers during the months they labored at Ground Zero. Take the Tour; Know More!